The last three times Butler needed a new basketball coach, athletic director Barry Collier filled the vacancy by hiring an assistant on the former coach's staff. Therefore it should come as no surprise that the man Collier has chosen to replace Brad Stevens is the only assistant coach Stevens ever hired twice. 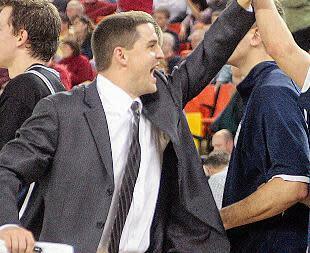 Former Butler point guard Brandon Miller, who coached under Stevens during the 2007-08 season and returned for a second stint as an assistant in April, will instead inherit the head coaching job at his alma mater, the school announced Saturday. To get the job, Miller, 34, had to beat out another former Bulldogs star, Michigan assistant coach LaVall Jordan. That Collier only considered candidates with strong Butler ties is a testament to the success the program has enjoyed doing business that way. Thad Matta, an assistant under Collier, earned Butler's first NCAA tournament win of the 64-team era before moving on to Xavier. Todd Lickliter, an assistant under Matta, led Butler to a pair of Sweet 16s before bolting to Iowa. And Stevens, an assistant under Lickliter, elevated the program from the Horizon League to the Big East on the strength of back-to-back NCAA title game appearances in 2010 and 2011. If Miller is going to continue the ascent Butler has enjoyed under his predecessors, he'll have to overcome different challenges than any of them faced. Butler will begin play in the Big East next fall, capping a whirlwind two years in which the Bulldogs have gone from titans of the Horizon League to contenders in the Atlantic 10 to an uncertain future in a major conference that includes the likes of Georgetown, Villanova and Marquette. Collier clearly saw something in Miller's background that suggested he could have Butler in the upper echelon of that league despite resources that don't match some of its Big East peers. Miller graduated from Butler in 2003 after winning three league championships, reaching the Sweet 16 and scoring more than 1,100 points. In addition to his two stints at Butler as an assistant, he worked for former Bulldogs coach and current Ohio State coach Thad Matta as a video coordinator, director of basketball operations and assistant coach. He also spent last season as a special assistant to Illinois coach John Groce. By hiring Miller only three days after Stevens' bombshell announcement he was Boston-bound, Collier didn't allow instability atop the Butler program to linger into the July recruiting period. Butler now has its new coach, and it's a man with a familiar background and some unfamiliar challenges ahead of him.